How do I convince my wife? Well, that wasn’t a convincing performance. We have August, high season, and probably the head was too packed with romantic pictures of an old blue T4, with the impressions of the legendary two-month route from ex-Yugoslavia to southern Greece, of the countless trips to France, and not to forget, the spontaneous festival trips. Blame to me when I rather rediscover old photo albums in the basement instead of cleaning up the cellar. A few years have already passed since the camper with the good old Westfalia expansion drove through half of Europe. Today, we have a practical family caddy. But what’s wrong with a starry sky over the bed, a cappuccino in the morning at the bar and an itinerary based on the weather situation? Why should we further credit tour operators during the peak season? You need a plan for the summer holidays? What about camping in Bavaria? Let’s do this adventure before we end up as a package holiday tourist. But: How do I convince my wife? Well, at this moment, I am not sure whether I want to see her shuffling across the campsite in grey sweatpants in the morning. Nevertheless, at the end of June, when we sat together in the garden with the whole family and all cousins (at the age of two to six), I got the green light. Even if the mothers fought for real mattresses for the little ones, the track was set: “We have to go to a lake and camp there. 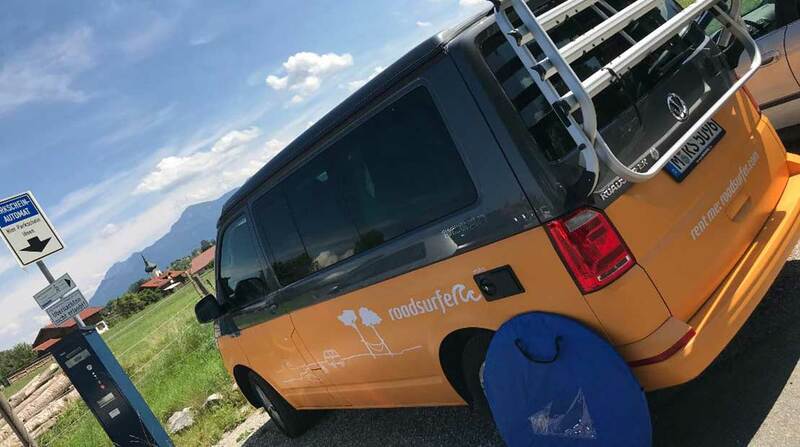 And we could also get there with a camping bus – camping in Bavaria!” The kids immediately agreed that this was a great thing and, contrary to expectations, there was no audible resistance from my better half. But that should have made me suspicious. No sooner said than done: The magic word at roadsurfer was “intermediate rent”. There was a small booking gap between two longer rental periods. Friday noon pick up, Monday noon back. In the afternoon, we let the crowds pass through on the A9 towards the south while I try to stow the clothes between two children climbing in the bus and settling the first argument about who is allowed to sleep upstairs. In the evening, we finally get out of Munich and start our journey completely free of traffic jams to Staffelsee near Murnau. "We can also take a camping bus!" And in fact, there are even two free sites with electricity in the quiet Bad Kohlgrub. Dinner is served as a snack, beer and milk are in the fridge. So why wander far away when there is already a free place here? At the push of a button, the roof is put up again and, to the delight of the immediate camping neighbors, also a new quarrel: “Dad, who’s sleeping upstairs now? Me? – No Me!” – We make a quick raffle with the outcome that one of the kids is ending up in tears. But then, a smooth surprise: “Here really is a lot of space and the view into the sky is just beautiful!” My wife seems to get a little pleasure from our spontaneous trip. That’s it! I just quickly throw the tent in front of the Bulli so that the child seats don’t take up unnecessary space inside. And then: Good night! While our neighbors already have breakfast, we still start our day very comfortable: reading books and building a cave for the little ones. Since I found out that I forgot the coffee at home (In spite of great planning), we go to the breakfast buffet in the neighboring hotel. The buffet is very delicious, and on top, all the food is organic. So lazy! But it was the right decision: I wouldn’t have had a prosecco with me (but next time for sure) and we cannot think of lunch after that long breakfast at all. While the kids discover the big playground in the garden, Mom and Dad are sitting relaxed on the bench. This is what a perfect weekend looks like! But finally, the adventure calls out: the old mountain railway to the Hörnle in the foothills of the Alps may be getting on in years but is still a real test of courage: You sit on old, wobbly wooden chairs, you are not (!) strapped, and you only have a small iron flap closure like on a baby swing while you are floating high above the trees and valleys. Whereas the little one is very enthusiastic, Daddy puts his arm around her and prays that the trip won’t take so long anymore – My three-year-old is slipping around in her seat or is suddenly bending forward… Not for the faint-hearted! We are approximately 15 meters above the slope and a climbing equipment with a connection to me wouldn’t be worse now. In front of us, the older one and mum wave. I have to keep on telling exciting stories while we are sitting: “Look, there are cows!”, she suddenly says and turns wildly backwards and bends down! Oops, just hold her. Compared to this, the hiking on the slope and the climbing later on the mountain was really no adventure anymore. Back in the valley, it’s getting hot: off for a swim in the lido at Staffelsee with the best sandy beach in the foothills of the Alps. No disturbing stones and a diving platform in the middle of the lake. The Bulli stands on a shady parking lot opposite the football club. According to the sign, “real” camper vans are not allowed there. That means, the people have to walk a long hike from the parking lot at Murnau station. My Bulli and I continue to collect points – and cold drinks from the on-board cooler also make an impression on my better half. Camping in Bavaria: Who sleeps where? Second night, back to Bad Kohlgrub: this time, we have a site with direct view to the landing meadow of the paragliders. Thanks to that, we escaped from the expected children’s nagging because of the missing Sandmann broadcasts on KIKA. The contrary happens: Noodles with tomato sauce are a big hit. Nevertheless, a quarrel about who can sleep upstairs and who can sleep downstairs comes up again. Also on the next day, we face new, undreamt-of possibilities: The Münter-Haus, the birthplace of the artists’ association “Blauer Reiter”. We have no queue but even if there would have been one, we haven’t had a long drive anyway. Then the next experience in the afternoon comes up: Schloss Linderhof. The place is also very relaxed since we arrive shortly before the closing why we have no queuing in the midday heat or overcrowded rooms as the masses of tourists are gone long ago. Also the pizzeria for dinner is not far away and the parking place with the unbelievable panorama near Oberammergau is quickly reached. One more giant “Schnitzel”, please! In the next morning, we only have a short cereal breakfast before we drive off through the mountains to the Achensee in the direction of Tyrol. We want to return home in the afternoon right before the crowd of Munich’s Sunday tourists. But, I have made my plan without the new fanatic camping ladies: the return is delayed since they want another pony ride at the Magdalenenhof. After that, the sunset is in full swing and everyone wants a tasty meal at Nussdorf’s legendary “Schneiderwirt” (In particular: its unbelievable giant Schnitzels). Well, we should better spend another night in the mountains and get back early on Monday morning. In the end, the campervan is quickly cleared out, and we cleaned and vacuumed the campervan at a gas station. Thank God, the cuddly seal has been discovered in the closet at the bottom! How cool: An air conditioner in the back! Conclusion – What we keep positive in mind: The bed upstairs (with slatted frame), the outside shower, lots of storage space, a table to paint for the kids while driving, relaxed travelling without rush hours because neither traffic jam nor nonsensical long journeys are liked, and last but not least, the air conditioning for the back which does not even our family caddy has. I think everyone agreed on another roadtrip. Camping in Bavaria? It wasn’t our last time! We will definitely do a weekend trip to the mountains more often from now on. In fact, this has already been our passion before we got our children. But of course, without expensive overnight stays (where you don’t even get a place or at least don’t want to pay for in the high season), without a super early, exhausting journey, and finally, without nagging children. Arguing about who sleeps upstairs and who sleeps downstairs is nothing at all! What was it again on our way back home? I questioned the kids: “Where are we going to next weekend?” First of all, silence. But after a short reflection, they said: “Let’s go to Legoland and spend the night there. Then staying one more day and finally go back again to Legoland!” Pooh, that doesn’t sound very romantic but blame for myself when I awaken desires! roadsurfer location in your city!